Le Littre Hotel is situated in the 6th district of Paris, steps from Montparnasse train station. Le Littre Hotel's nearby neighborhood is really pleasant with many shops and cafes. Guestrooms are well appointed and very comfortable, many with a view of the Eiffel Tower. For guests on-the-go, you can benefit from the a special smartphone offer. 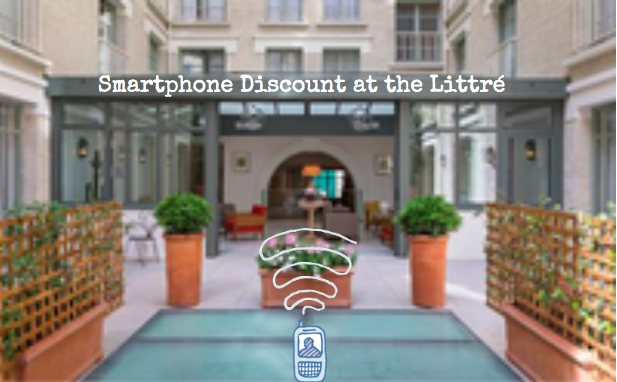 Le Littré hotels offers a discount when the booking is made through a mobile phone. The Name of the offer is the Smartphone discount -10% off the best available rate! Le Littre Hotel specially designed, 'thumbable' mobile site + VIP app cater to their mobile guests.